May 10, 2003Prelaunch at Kennedy Space Center On Mars Exploration Rover 1 (MER-1) , air bags are installed on the lander. 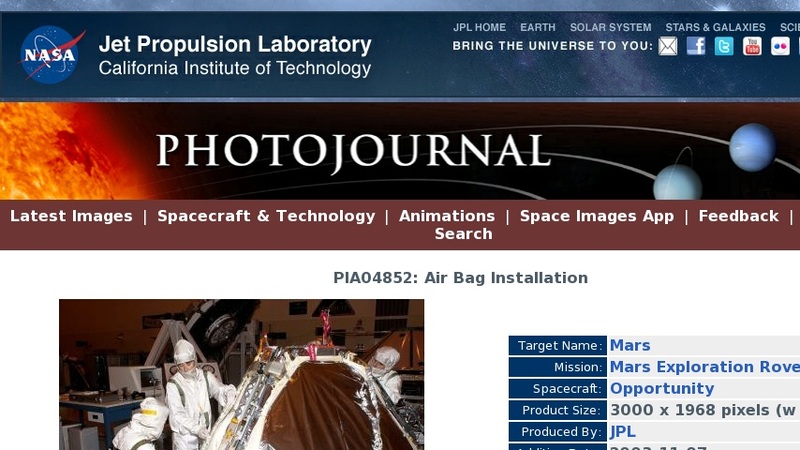 The airbags will inflate to cushion the landing of the spacecraft on the surface of Mars. When it stops bouncing and rolling, the airbags will deflate and retract, the petals will open to bring the lander to an upright position, and the rover will be exposed. NASA's twin Mars Exploration Rovers are designed to study the history of water on Mars. These robotic geologists are equipped with a robotic arm, a drilling tool, three spectrometers, and four pairs of cameras that allow them to have a human-like, 3D view of the terrain. Each rover could travel as far as 100 meters in one day to act as Mars scientists' eyes and hands, exploring an environment where humans can't yet go. MER-1 is scheduled to launch June 25 as MER-B aboard a Delta II rocket from Cape Canaveral Air Force Station.